Imagine this scenario – you are retained by an owner to design a new office building. In front of the office building are stairs and a corresponding ADA-compliant ramp to the front door. Shortly after the building is opened to the public, a visitor slips and falls on the ramp and suffers bodily injuries and sues the owner. A slip-and-fall like this should be covered by insurance, right? Yes, it should be, as the insurance industry handles slip-and-falls on a daily basis. But because it may be unclear whether the fall was due to improper maintenance of the ramp by the building owner or due to the architect’s negligent design of the ramp, it is likewise unclear whether the claim should be handled by the Owner’s commercial general liability policy or by the A&E’s professional liability policy, or both. Insurance, Builders Risk Insurance, and Professional Liability Insurance. complies with both the contract and state law. 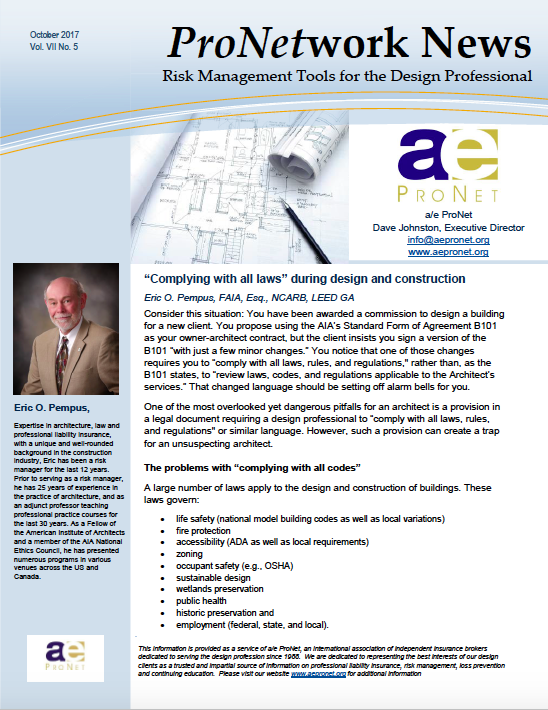 One of the most overlooked yet dangerous pitfalls for an architect is a provision in a legal document requiring a design professional to “comply with all laws, rules, and regulations” or similar language. However, such a provision can create a trap for an unsuspecting architect. It is not every day that a court throws a $10 million dollar lawsuit out of court on procedural grounds. Unfortunately, that’s what happened to a Northern California prime contractor. 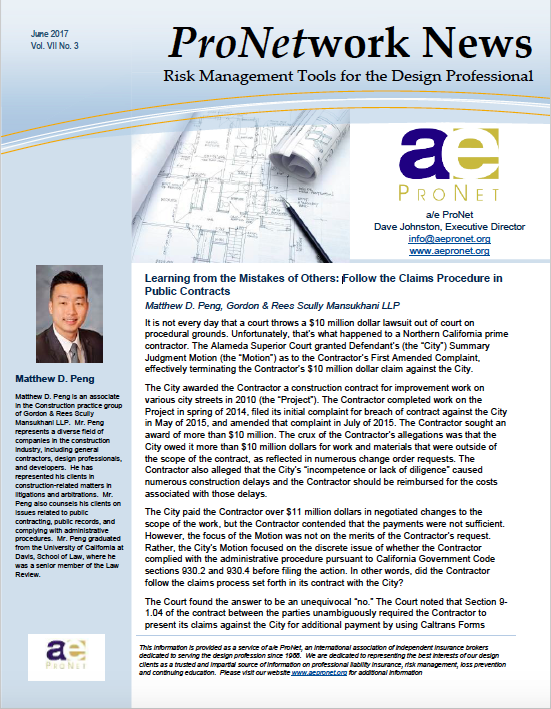 The Alameda Superior Court granted Defendant’s (the “City”) Summary Judgment Motion (the “Motion”) as to the Contractor’s First Amended Complaint, effectively terminating the Contractor’s $10 million dollar claim against the City.